Lacerations are one of the most common injuries sustained in the workplace. The good news is that they are largely preventable, given the right training and the right equipment. As concerns the latter, safety managers the world over continually hunt for the safest safety knife—and we believe that search ends with Slice. Before talking about how Slice has made common industrial cutters like utility knives and box cutters safer, it’s important to give a brief look at why laceration prevention should be a key workplace safety focus. First off, cuts hurt. Even small lacerations can be irritating and painful for days. More serious lacerations not only cause pain, but they can lead to severed connective tissue or nerves, and permanent damage. This can require hospital visits, surgery, and follow-up care. While any cut should be avoided, those sustained on the hand can have a particularly negative impact on workers. After all, what job doesn’t require you to use your hands? Such an injury can sideline or handicap an employee for days, weeks, even months. For the employer, lacerations are shockingly expensive, once you consider all of the direct and indirect costs. In addition to the possible increase in insurance or worker’s comp premiums, any injury disrupts productivity. There is also the cost of paid time off, if required, and hiring temp help or overburdening staff to fill in for the injured party. Bottom line, preventing lacerations should be a safety priority. 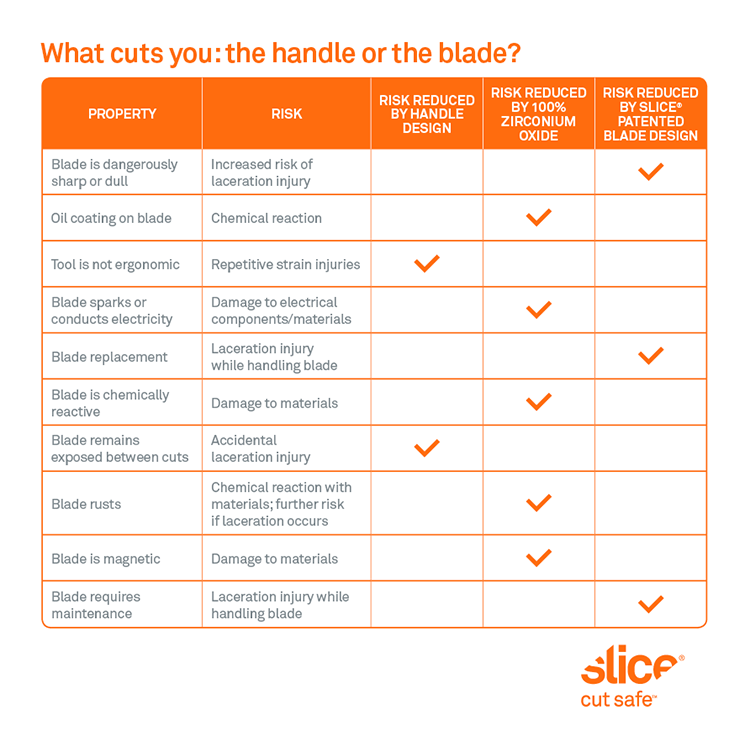 You can get a jump on that by discussing laceration prevention in safety moments, including steps to avoid cuts on safety checklists, and by switching to Slice. In the world of safety knives, the primary focus has been on handle design and reducing blade exposure. While these are steps in the right direction, they don’t get to the part of the cutter that does the damage: the blade. Slice is the only company to create a safety blade. All Slice blades are made out of 100 percent zirconium oxide, an advanced ceramic. The blades feature Slice’s proprietary grind, which is finger-friendly—much safer to touch than a traditional blade. Note that there are other companies that use advanced ceramics for their blades, but those blades are still dangerously sharp out of the box; the same is true for metal blades. That is, not all ceramic utility knife blades or box cutter blades are created equal, even though they’re often discussed as having the same qualities. Buyer beware. While zirconium oxide is much harder than steel, some ceramic blades use different materials, or less than 100 percent zirconia. Blade thickness and design matters, too. Tests of Slice safety blades show that they last up to 11 times longer than steel. This makes them a great value. It also means fewer blade changes, which adds another element of safety: cuts are more likely to happen when you’re handling a blade. Because metal is relatively soft, it dulls quickly, which is why it’s overly sharp out of the box. An overly sharp blade is particularly dangerous. On the other hand, a dull blade is also a dangerous blade, as more force is necessary to perform a cut. And dull blades still pose a hazard, so must be disposed of in a sharps box. Slice blades do not require such extra care. So when it’s time to switch out utility blades, for instance, you can just throw old ones in your regular trash or recycle them where facilities exist. Slice blades have many other upsides. Slice offers a full line of cutting tools and for each we worked with world-class designers to reassess handle design. The result is that all our tools are ergonomic, with several featuring uncommon or unique designs. 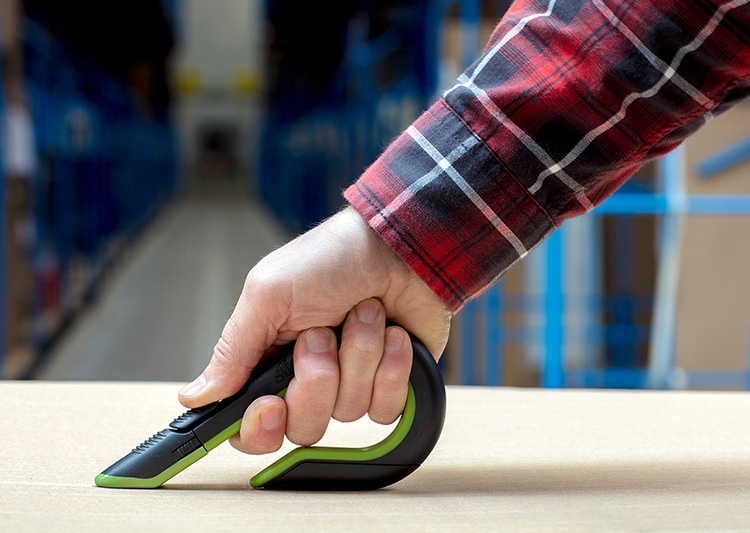 Ergonomic tools reduce muscle strain and thus lower the chances of fatigue and repetitive stress injuries. Take, for instance, the Slice box cutter, which features our J-hook design. 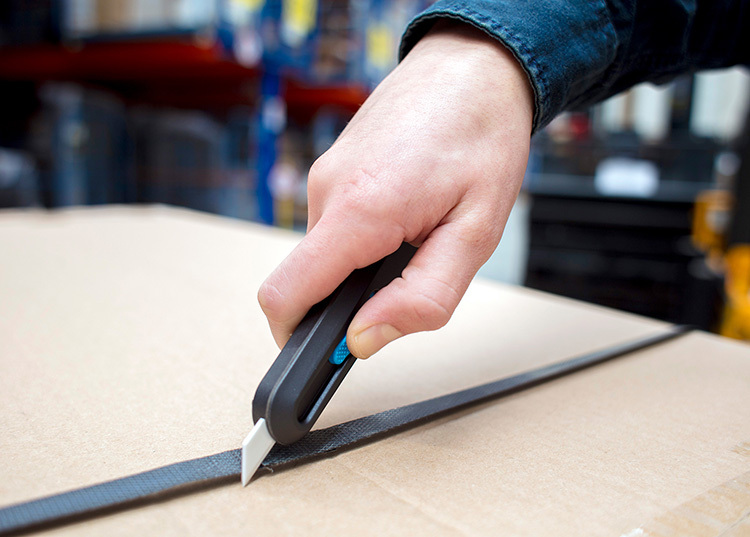 The wrap-around shape fits naturally in the hand and provides an easy cutting motion. It also protects the hand from any protruding objects such as staples. Slice does employ more traditional forms when it makes good design sense, as with our utility knives. A common feature of all Slice tools is a surface that ensures a good grip, which reduces the chance of slipping. When the cutting tool industry looked toward creating safer options, they landed on the retractable handle. Many cutters feature handles that either offer fixed retraction or auto-retraction. Fixed-retraction (or manual) handles have a slider that the user must engage and push forward to expose the blade at a preset depth. To return the blade to its retracted position, the user must again engage the slider and pull the blade back into the handle. Auto-retractable handles require the user to keep the slider engaged at all times to keep the blade exposed. If the user loses contact with the slider, say if they drop the knife, the spring-loaded blade automatically returns to its recessed position inside the handle. 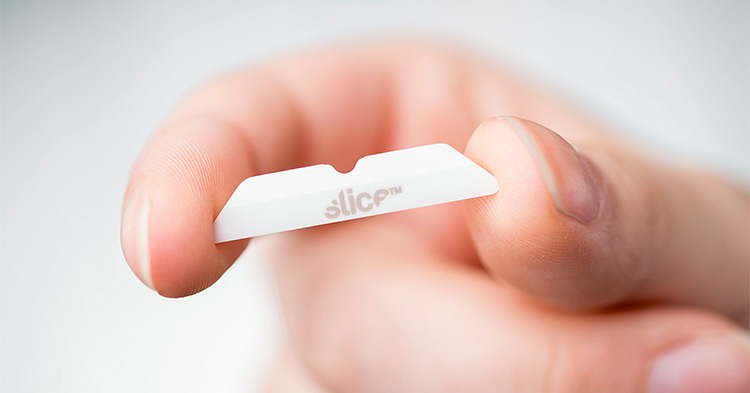 Slice offers both a manual and auto-retractable box cutter. The same holds for the utility knives, but Slice also offers a smart-retracting utility knife—the ultimate in safety. This model operates much like its auto-retracting cousin, in that the slider must be engaged to keep the blade exposed. Additionally, the blade must be in contact with the material being cut. If there is no cutting pressure on the blade, it will retract, even if the slider is still engaged. This lowers the chance of an injury if the user’s hand slips during a cut. Are You Ready to Up Your Safety Game and Reduce (or Eliminate) Lacerations? At Slice, we routinely get feedback from customers about how much they enjoy the greater safety of our tools as well as the longevity of our blades and natural fit of our handles. Our primary interest is always your well-being. To further that mission, we also publish a weekly Workplace Safety blog. Please visit our blog and website often (we’re continually developing new products), and share your Slice successes with us. TJ Scimone founded Slice, Inc. in 2008. His goal: to create safer cutting tools. TJ works with internationally recognized designers to create a unique line of tools, all of which are ergonomic and feature finger-friendly® blades.